President Hassan Rouhani met with his Russian and Chinese counterparts in Bishkek, Kyrgyzstan on September 12 and 13. Rouhani’s visit to the Kyrgyz capital for the Shanghai Cooperation Organization summit was his first official trip abroad since taking office in August. Rouhani discussed the Syrian crisis in his first meetings with President Vladimir Putin and President Xi Jinping. Russia, Iran and China are three of the Syrian regime’s most important backers. Tehran and Beijing have both supported Moscow's initiative to transfer Syria's chemical weapons to international control. Iran is key to Russian and Chinese interests in the Middle East. Putin and Xi both reiterated their strong support for Iran’s right to peaceful nuclear energy in their meetings with Rouhani. Rouhani and Putin agreed that they could do much more to promote bilateral trade and economic relations. 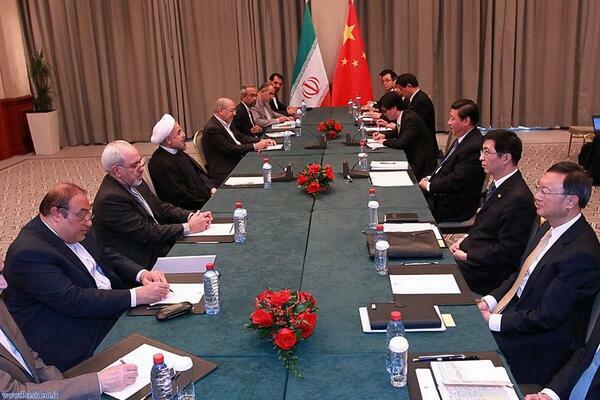 Beijing, on the other hand, has been increasing trade and cooperation with Tehran. China has remained one of Iran’s biggest oil customers despite reducing its purchases to avoid U.S. sanctions. The following are excerpted remarks by the three presidents. “Russia’s initiative on Syria, as well as steps taken by the Syrian government gave us hope that we would be able to avoid a new war in the region. “Regarding the Iranian nuclear issue, we want the swiftest solution to it within international norms. “Russia in the past has taken important steps in this sphere and now is the best opportunity for new steps from your side. “I declare that only if there is political will, if there is mutual respect and mutual interest, and only if the rights of Iran's people are ensured, can we guarantee the peaceful character of Iran's nuclear program. “The majority of U.N. member states, including the 120 Non-Aligned movement members, have dismissed the sanctions against Iran as illegitimate, illegal and politically motivated. “These sanctions are an uncivilized move and a dangerous precedent [and they are] aimed at disrupting the trend of Iran’s development [and have] targeted the ordinary and innocent [Iranian] citizens mercilessly. “There are many ways to expand Iranian and Chinese relations in bilateral, regional and international fields that the two countries must consider. “Iran–China ties have always been based on friendship, and are growing. “We know to what extent international affairs turn upon the Iranian nuclear problem. But we in Russia know also that Iran is our neighbor, a good neighbor. You don’t choose your neighbors, and we had cooperated, are cooperating and definitely will cooperate a lot.